Good morning! I am so very excited to bring to you an artist that I have been admiring for a very long time. Her passion for God and love of the solar system made it so easy for me to spam her Instagram account with love and heart-eyed smiley faces! I hope you all fall in love with her art as well as her story. Happy Maker Series Day. 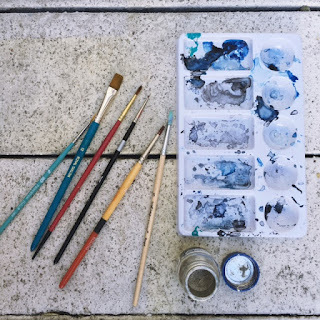 My name is Jessica Weymouth, I am a 23 year old college student creating watercolor pieces out of my seaside home in Long Beach, CA. Most of my creations are worked on in home, however if I find that I'm struggling to zone-in I will pack up my supplies and head to the beach, the bluffs overlooking the ocean, or sometimes even a favorite local coffee shop. I am currently focusing my artistic endeavors within the celestial spaces and lunar cycles. I developed a particular interest in solar systems and galaxies as I found myself being hummed to sleep by the sound of our Mother Ocean and the movement of Her tides; I quickly became fascinated with the relation of Our moon to our vast bodies of water, and how the waning phases effect humanity- not only physically but also emotionally. I have always felt creatively driven, I experimented with most all mediums growing up (sewing, weaving, pen + ink) but felt a particular comfort and homeliness with watercolor - perhaps its the way it unapologetically flows to its own liking, or the minimal amount of paint it requires to create something beautiful. I sort of began experimenting with textures, colors, and somehow ended up on a spherical series of the stars that inhabit our solar system. As of right now, I have not taken any art classes pertaining to my work (unless high school general art counts...). I attempted taking art classes in school, but I always struggled to properly articulate the ideas that lived inside of my head. I always snuck by, passing on participation alone - never on quality of work. My professors would probably be genuinely surprised at my level of artistic interest in my current studies. I remember growing up I longed to be talented at something artistic, and it's such a beautiful circle to find myself living out this dream I craved as a child. I actually couldn't live without my ruler. I utilize my ruler in most every single piece (yes, even the spherical ones). I have numerous rulers ranging from 4 inches long to a meter in length (I even have an alligator ruler) I map out the area of the surface I am working on, utilize the ruler for placement, and even make my circles using rulers, two clothes pins + a pencil. I find inspiration in various ways. Sometimes I feel most inspired to create after a Sunday church service, listening to the Gospel and watching it lived out in the community around me really inspires me to create things that build a more beautiful and healed world. Sometimes I search through NASA's various missions, finding moons or planets I wasn't aware of and learning super cool facts that make me want to create. Other times I see a beautiful or heartfelt piece of art by a fellow artist and simply feel changed by it - that enlightenment urges me to create, and share, and heal those around me through paint and brushstrokes. To be honest, sometimes a piece is clearly finished and I wipe my hands clean knowing I have fully articulated what my heart set out to share with the world. Other times I find myself frustrated or distracted from a piece, and end up calling it quits/"done" and leave the piece open to interpretation. The funniest thing I've found when hanging my art with other people is their sheer inability to figure out which side is up or down (no matter how "done" and clear the piece looks to me) Its actually a beautiful thing, to think that I know this creation so well that I assume everyone else see's what i see when I look at it. Art seeps into all of us differently, and its such a beautiful reality. Oooh, I would say my perfect day begins about 9am with breakfast at a local favorite The Coffee Cup or Blackbird (to be precise) and takes me next to a favorite local coffee shop, perhaps Rose Park for their absolutely phenomenally homemade Vanilla Bean Latte with soy milk and one of their comfy chairs to curl up in and read a few chapters of whatever has caught my eye this week. Next it would take me for an afternoon swim at a nearby beach, Corona Del Mar or Huntington perhaps - and on the sweetest days a friend will join. The late afternoon would bring me home and lay my supplies out in front of me, and allow my process of creation to begin. A personal favorite image to work on for me is a moon or planet - into which I love the inclusion of healing crystals. The evening would come quickly, as the time seems to move swimmingly when you are creating something out of love and authenticity, and would wane to an end with a warm bowl of veggie pho and the eventual bedside book-read/netflix-binge. The best advice I have ever been given (and have tried to the best of my abilities to pass on to fellow makers) is the truth that you will make pieces (even well into your career) that you are not proud of- but you must continue to pursue your dream. If every 1 in 10 pieces you make is magic, so be it. What matters is the end result, the joy you feel from that ONE piece that made the cut. Chase your dreams, and don't allow your human mistakes to hinder your ability to shine! 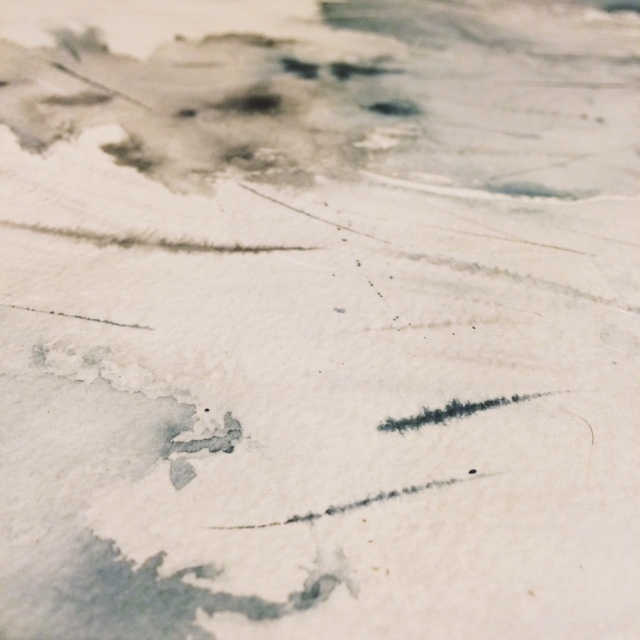 As an artist, I become deeply attached to my original pieces. I rarely let go of originals (unless commissioned or created to be given away) as I feel that I pour some of my soul into these pieces. Sometimes I find eyelashes or tiny microscopic pet fur in my originals, alongside the tiny brush strokes and organic textures, further providing an intimacy that sets fire to these attachments. I find a lot of inspiration in our solar system, the vast and divine structure that holds all of our planets, moons, stars, and galaxies absolutely enchants my heart. I follow the work of Nasa and have based many of my spheres on their missions, but I also find quite a bit of joy in creating my own solar systems, filled with planets and moon's I've seen in dreams. I sometimes include a little note with my pieces that I ship out to the beautiful people of this planet, explaining to them how much love and positive energy I've put into these pieces, how much healing they've brought me, and how I wish to bring this healing to them. Art and music are some of the closest forms of magic many of us will ever experience in this life, and I pray that there are many days where these lovers can look up at my healing moons and be reminded of the beauty that this life brings, and the wonderment that we are blessed with after a spiritual rebirth. One of my favorite quotes by Andrea Gibson is "Sometimes the most healing thing we can do, is remind ourselves over and over, other people feel this too." I want my pieces to serve as a reminder that you are not alone, your heartache and your joys and your stories are worldwide, we all are on the same journey and we all have days we will need healing from. I think as a person of interest (an artist, musician, blogger, etc) we are all meant to be an instrument to the world, it is our human obligation to encourage those who need encouraging, and affirm those who deserve affirmation. I want to use my creativity and my standing to promote positivity and to remind people I love and people I have never met that they are strong, resilient human beings created for big things. I want to shed light on not only how important it is for us to keep going, but for us to remind those around us that they must also keep going. 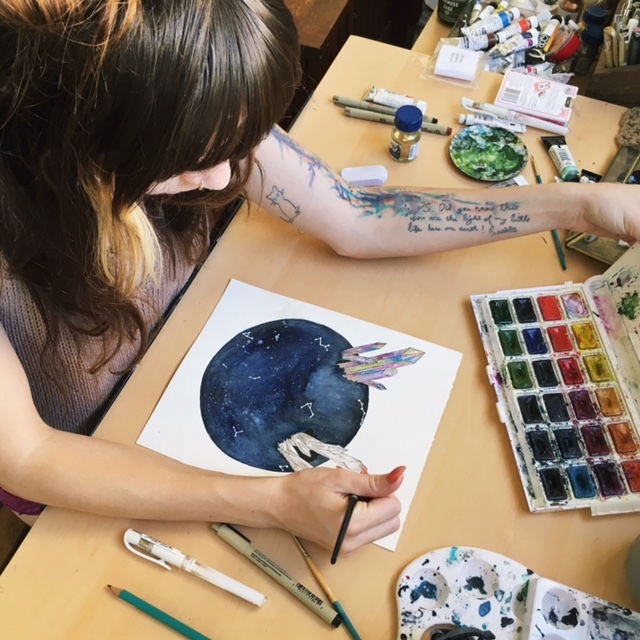 "Weymouth hopes to bring healing and rebirth to the broken and suffering world, through her artistic endeavors as well as her collected experiences. She lives on the notion that we are all suffering and how we overcome this suffrage is by hurting, growing, and healing. 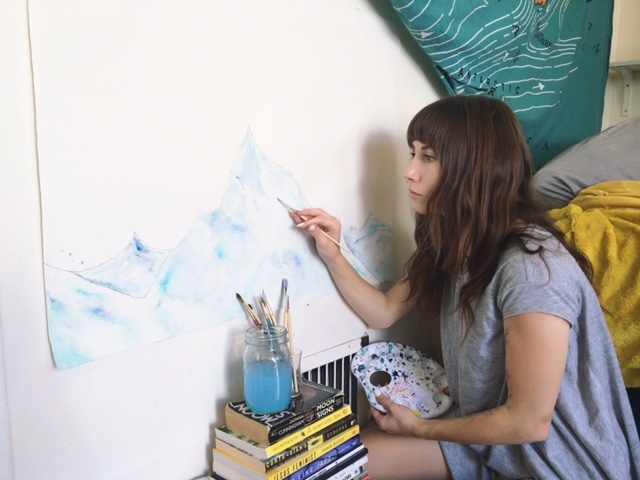 The crystals in her pieces symbolize the healing she hopes to bring through paint and brushstrokes." A huge thank you to Jess for letting us hear her story and how she is so passionate in what she does. I agree with her completely that we need to encourage those with the gifts and passions that God has given us. I hope you enjoyed reading as much as I did! 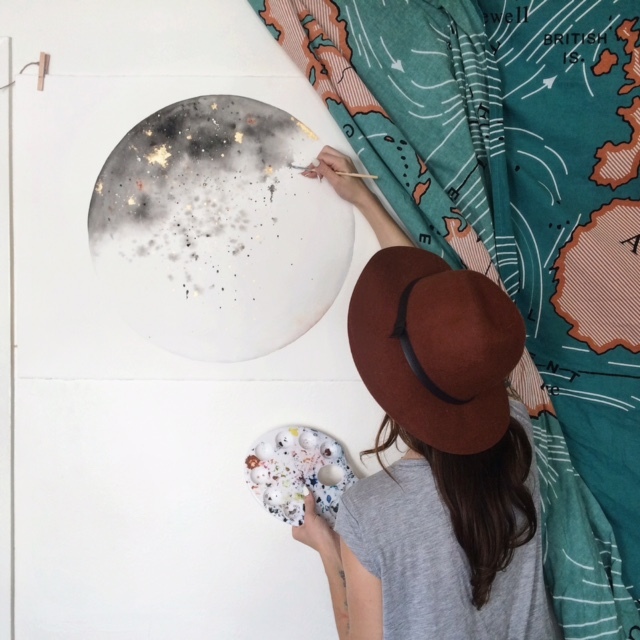 Definitely check out Jess' Instagram account and her Etsy store to see more of her artwork. 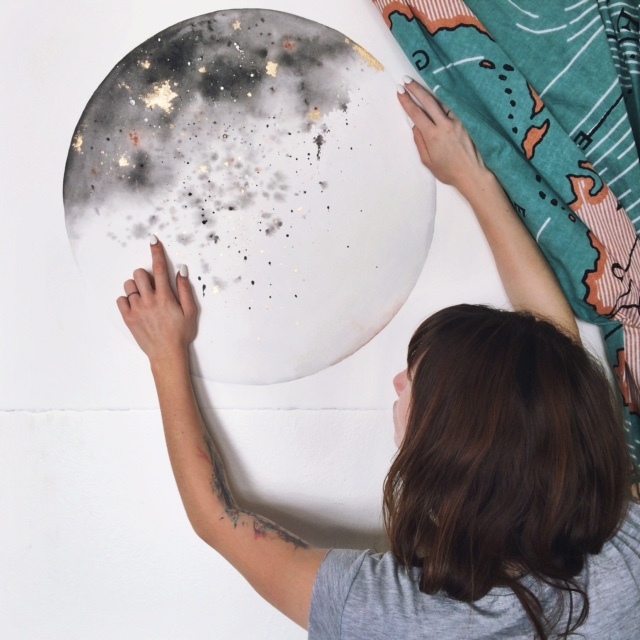 I am in love with this print & this print from her store, and I am in love with this moon and this planet from her Instagram feed! Last, but definitely not least (and if you love all that I have posted so far, you should just go and check out all of her photos already!) Jess posted today that she has started creating business cards - which I think is awesome!